Nicht verpassen – dieses Wochenende! Workshops finden zwar keine statt – aber Privatlektionen können weiterhin gebucht werden auf 078 808 03 54 ! Demián García is a dancer, teacher, jury member and choreographer with integral artistic studies. He developed his career in two different and complementary areas with the same intensity – the artistic and the pedagogic. He has performed in many important shows in Buenos Aires and he participated as a jury member in several important championships of Tango de Salón and Tango Escenario, and as an artist and teacher in numerous international festivals. He toured the world over 30 times, performing in concerts and shows and giving workshops in a large number of countries and cities. He visited all Europe, Russia, China, Japan, Korea, Australia, New Zealand, Brasil, Canada, United States, Libanon and Uruguay. 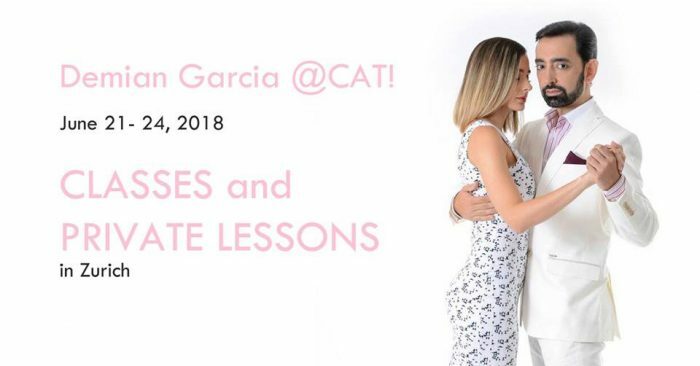 He gives regular lessons in Buenos Aires at Salon Canning, Club Gricel and the Escuela Mundial de Tango. The quality of his teaching and his dedication to details allows the students to develop their dance in a harmonious and personal way. He fluently speaks English and Spanish, and also knows some French.